The BTS2048-VL is controlled through a USB2.0 or Ethernet interface. The data transfer rate using the Ethernet interface is much faster than USB 2.0. The Ethernet interface can be directly connected to a network using a patch cable. The device is allocated an IP address by the network. Direct connection to the PC is also possible; in this case, the device allocates an IP address itself. VL using a PC since no extra power supply is required. 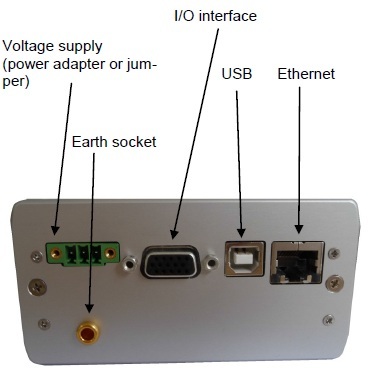 RS232 and RS485 interfaces are also standard. These could be used for an external temperature sensor for example. Two outputs and one input are available for use for triggering functions in automated production applications.